The Bitbox Console: BitBoy : a gameboy emulator for bitbox ! BitBoy : a gameboy emulator for bitbox ! 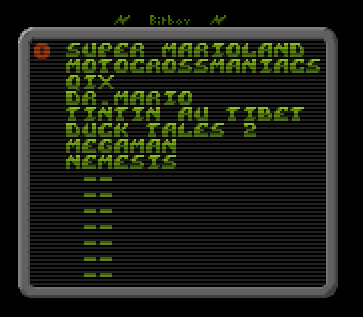 BitBoy is a port from the gnuboy emulator heavily modified to fit in the Bitbox console. The Gameboy emulator successfully emulates several games and homebrews for this venerable console. NB : Emulators are standard SDL games built with all bitbox programs running on the bitbox kernel with no modification of the game source code as the normal build of any game. 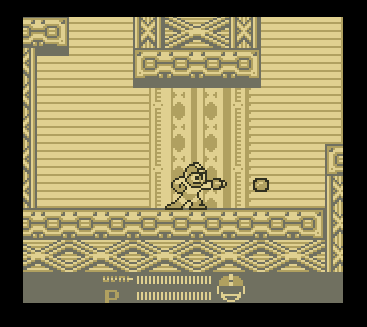 4 color palette B&W display, with custom palettes (fixed colors by game) to colorize the games. rewriting the main loop & main function (from command line to bitbox kernel frame interface), remapping time-relating functions. interfacing the sound callbacks of bitbox to gnuboy engine generation. removing / disabling all file related functions. Some could be re enabled to save some backup RAM to SDCard by example or load data cart from SD Card. rewriting all the display code, not to fit bitbox display model -this adaptation was done quite simply by blitting a virtual framebuffer, but to make it faster and not depend on huge (100k) in-memory precomputed tables. Now only B&W GB has been done, but color could be done. writing a blitter for the gnuboy pseudo-vram to Bitbox graphical kernel. Maybe this step (and the 2 VRAM buffers) can be skipped and real Bitbox lines be generated on the fly by the new gnuboy, faking Gnuboy v-syncs from the real Vsync bitbox interrupts. modifying the memory mapper to use bitbox flash / Ram & mapping some RAM data (2 VRAM buffers) to ccm ram in order to save place in sram, disabling many functions like rom compression, battery-powered ram. linking ROM to custom palettes : Color games are not supported yet (colorized games using custom palettes are supported however), but given the size of those color games, they often wouldn't be able to be stored on the box anyway. cutting color gameboy features to simplify development and lower memory requirements (standard GB has 8k, GBC has 32k of RAM, which could fit in CCM RAM, 16k VRAM vs 8k, and much larger games - often starting at 1MB). Some graphical glitches on games (or frankly ugly artifacts), yes, they exist. Sound has been neglected, ie should work, has worked, but now doesn't. Loading ROMs from SDCard to RAM (64k max cartridges) - or even flash programming from uSD ? HiDef Scale2x type graphical output ? Support of GBC seems doable, maybe in a future release, this would include working around memory limitations and reimplementing color GB features in graphical layer, on the fly loading some pages in RAM from SD to handle large ROMs? 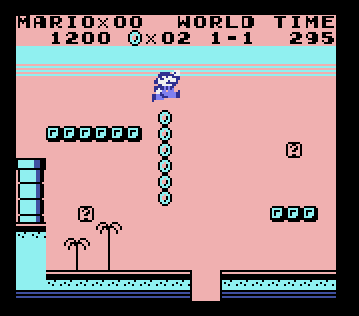 Maybe adapting this emulator or graphical engine for NES ? How I can resolve these unimplemented functions? New game published : Fire !